*This is a sponsored post for Olive Garden’s Cucina Mia menu. All thoughts and opinions expressed are our own. Hosting friends and family can be an intimidating task. You primp and preen, tweak and tease, hustle and flow just to provide a fun atmosphere and a delicious meal, so that you and your guests can enjoy your time together around the dinner table. While entertaining a crowd can certainly be fun, it can also be a lot of work. Enter Olive Garden’s Cucina Mia. Even foodies like us need a break from the hot kitchen to enjoy a relaxing evening out. Cucina Mia is Olive Garden’s fun way to create new pasta classics with a choice of six pastas (large paccheri, tri-colored vegetable penne, bucatini, cavatappi, whole wheat linguine, gluten-free rotini) and five made-from-scratch sauces (creamy garlic asiago, primavera, creamy sun-dried tomato, spicy diavolo, fresh tomato pomodoro.) Then you can top off your Cucina Mia creation with a choice of their chicken meatballs, sausage meatballs, meatballs or sautéed shrimp. With Cucina Mia you can host your own pasta-bar party, without any of the fuss or clean-up. For $9.99 Cucina Mia fits any budget, just save room for dessert. Inspired by Olive Garden’s Cucina Mia menu, we decided to host a small pasta party with a few family members. We had penne, farfalle, and spaghetti as our pasta choices. Our sauces included sun-dried tomatoes with capers, and a simple marinara sauce. We created our own chorizo meatballs to top off our pasta creations. We had a blast developing this recipe, cooking for dear ‘ol dad, and sharing memories over a photo cataloging project. 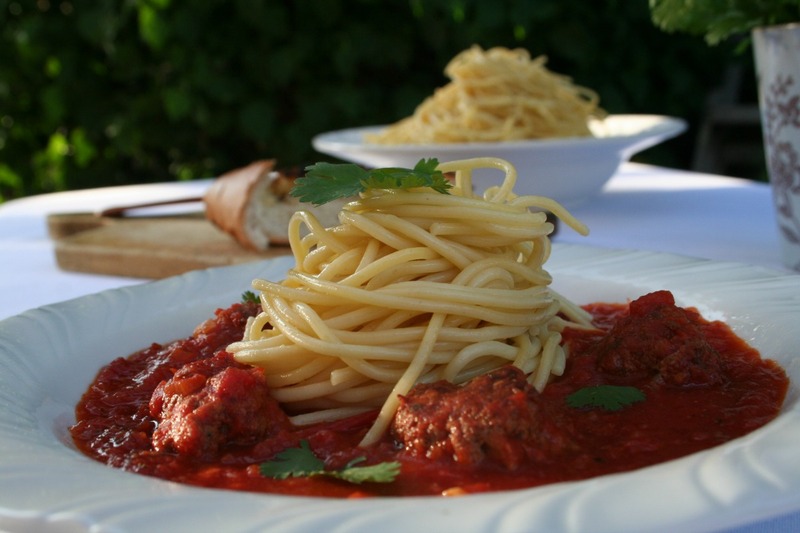 Below is my recipe for the chorizo meatballs, which I used to top off my classic spaghetti with marinara. But I’ve been thinking that a chorizo meatball sub sandwich sounds pretty good, too. Mmmmm…. maybe with rajas and gooey, melting cheese on a toasted french roll. Either way you choose to eat your chorizo meatballs, take this recipe and rock your next meal. In a large bowl thoroughly mix all the ingredients. A pair of clean hands will work best. Using a 2 tablespoon measuring spoon, scoop out the mixed meat. Roll into a small ball between your palms and place on a baking sheet. Place in the refrigerator to chill for 15 minutes. Once chilled, you can reshape your raw meatballs into a rounder shape if necessary. Remove the meatballs from the pan and allow to drain on paper towels and continue browning the remaining meatballs, wiping the pan between batches. 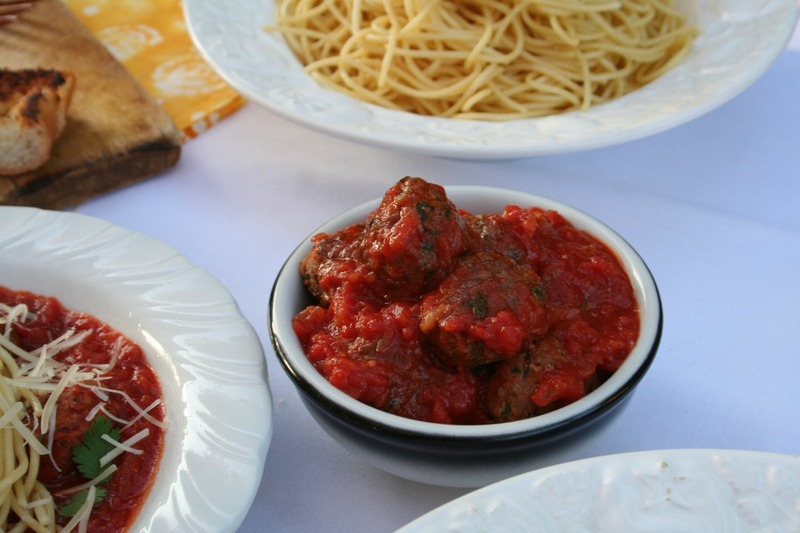 Your chorizo meatballs probably will not cook all the way through, so you can finish cooking the meatballs in the oven (350°F for 10-15 minutes or until cooked through) or simply finish cooking the meatballs in your marinara sauce.